Tags: Historicity of Jesus, Howell Smith: Jesus Not Myth, Howell-Smith, It is absurd to suggest . . .
Good old reliable Professor James McGrath and a few of his peers*, blissfully unaware of some of the highly respected names both within and outside New Testament scholarship who have happened to be bold enough to declare their maverick suspicions that there was no historical Jesus, make it clear that if you come out as seriously pondering such a view in their presence they will shut you up immediately scornfully mocking and insulting you. If you dare to ask why they insist the view is such a stupid one they will often enough declare that the arguments have been dealt with and laid to rest long ago. 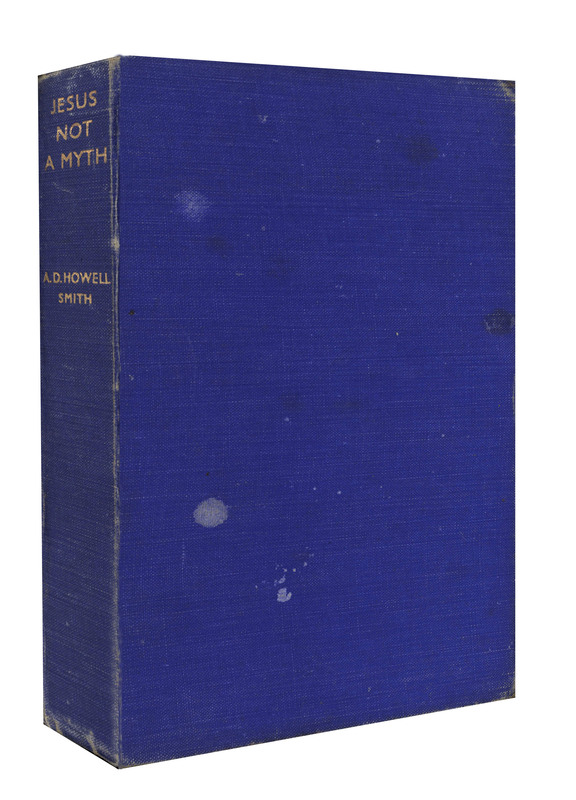 In our previous post we introduced another early author who tackled mythicism, A. D. Howell Smith. We covered his overview of the various mythicist authors and ideas extant, along with their contemporary critics, in the late nineteenth and early twentieth centuries. This post continues a little series responding to the assertion that the Christ myth notion has long ago been dealt with and demolished. Rather, we will conclude that it has been more generally ignored. The most recent attempts to have dealt with it (McGrath, Casey) are more about character-assassination of those who post anything sympathetic to the idea and about ridiculing caricatures of the arguments. (Ehrman, as has by now been well demonstrated, appears not to have even read, or at least read incredibly superficially, the arguments he set out to refute.) I myself have never posted an argument for the Christ myth theory, but along with a good many others I can see some gaping logical holes in the arguments used to defend the assumption that Jesus did exist. In addition to rationalisations of this assumption we often encounter even liberal scholars resorting to rhetorical questions that essentially appeal to the expected ignorance or lack of imagination of their lay audience. Of the names carelessly assumed to have long ago accomplished the intellectual demolition of mythicism we have seen that our first two, Goguel and Wood, explicitly stated at the outset of their works that they were NOT going to seriously address the arguments of the mythicists. Howell Smith was not a professional scholar so perhaps that is why his book arguing against the mythicists of his day is not so well known. His book, Jesus Not a Myth, however, is well informed by the scholarship of his day. As we saw in the previous post Howell Smith in 1942 noted how very few scholars in the English speaking world had taken up the case against mythicism and those who had were flawed by their conservative religious bias. It was for that reason he wrote the book I am discussing in this post, Christ Not a Myth. Howell Smith’s work stands out for its occasional acknowledgement of strengths in some of the mythicist argument. I am not sure I have encountered any contemporary scholar who is prepared to concede any ground whatever to mythicist arguments, a trait that smells like polemics born of insecurity and fear rather than genuine engagement with the arguments. Here are some of my earlier posts covering Howell Smith’s refreshingly honest arguments. There is a critical case of some slight cogency against the authenticity of Gal. i, 18, 19, which was absent from Marcion’s Apostolicon; the word “again” in Gal. ii, 1, which presupposes the earlier passage, seems to have been interpolated as it is absent from Irenaeus’s full and accurate citation of this section of the Epistle to the Galatians in his treatise against Heretics. . . . .
What would be the motive for such an interpolation? If, as has been surmised, Gal. i, 18, 19 is an interpolation, the principal object of which is to stress the pre-eminence of Peter . . . . .
Howell Smith does not think the passage is interpolated but his manner of argument is refreshingly honest here. The Name Jesus Above All Names? This time the point in question is Philippians 2:5-11 from which some mythicists argue that Paul is saying that Jesus was not given his name (Jesus) until after his resurrection. Howell Smith does not engage in hostile polemics but calmly admits that such an argument does seem reasonable and proceeds to offer a plausible alternative explanation. It’s almost as if he respects the intelligence and integrity of those against whom he is arguing. Casey would never have approved. McGrath could never bring himself to argue like this. A passage has long been cited from his Antiquities of the Jews which obviously fits badly the matter preceding and following it, and appears moreover to have had a shifting place in the text. Despite the pleas of Burkitt, Harnack, Chwolson, and other eminent scholars, its authenticity seems to be rationally indefensible. . . . Possibly the forger has expunged a less appreciative notice of Jesus and primitive Christianity. But against this view is the fact that the existing notice is out of harmony with its context. . . .
Or of Romans 1:3 where Christ was said to be born of the seed of David according to the flesh? So where does the strength of Howell Smith’s case against mythicism lie? His targets are the mythicists of his own day. So five of his sixteen chapters focus on J. M. Robertson’s mythicist arguments. Central to these are the pagan parallels with the Christ narrative. Some of the parallels Robertson advances are “conceivable” or “possible” in Howell Smith’s judgment, but at the same time these “possibles” many other parallels are “not likely” or “implausible”. Others are “wrong”: so when Robertson suggests the name of Jesus’s father was inspired by the idea of a Messiah Ben Joseph, Howell Smith points out that the documentary evidence for this particular Messiah postdates the Gospels; and so forth. A good number of such parallels are still found in a range of good and bad, scholarly and amateur, mythicist arguments today. They linger not because scholars like Robert M. Price have ignored the counter arguments, but because very often the counter arguments are indecisive. “Not likely” is hardly a devastating knock-down argument. Interestingly Robertson made a concession to historicists not unlike one made by G. A. Wells a few years ago. Wells concluded that there was probably a real Jesus behind the Q sayings; Robertson in his later work said he would be prepared to accept the existence of a Galilean “faith-healer” who attracted some attention and who was subsequently merged with pre-Christian beliefs that turned him into a sacrificial deity. I think this is enough to demonstrate that Howell Smith, so commendable for his many instances of honesty in addressing mythicist arguments (an honesty and competence I have not seen repeated in the works of McGrath, Casey or Ehrman), does not deliver a death blow to mythicism. Readers interested in this topic will be aware of the way various arguments have been developed since the 1940s and will likely think Howell Smith has established several points from which the debate can continue. I don’t want to present Howell Smith as indecisive, however. He is very committed to the view that Jesus was historical. But as with any good scholarly study of a controversial point, one can learn a lot about the arguments of both sides despite the author’s clearly evident convictions. Continuing in a future post. . . .
and a few of his peers* . . .
And angry old lying Professor of Jim West continues to treat such sympathizers the way stereotypical Pharisees treated lepers, tax collectors and harlots. He refers to them (never speaks with them) as if they were untouchable vermin. And miserable old cranky Rabbi Joseph Hoffmann calls mythicists outright disease carrying buggers and pronounces smug curses in Hebrew upon their progeny. Posted on 2014-06-08 08:08:55 GMT+0000 by Neil Godfrey. This entry was posted in Biblical Studies and tagged Historicity of Jesus, Howell Smith: Jesus Not Myth, Howell-Smith, It is absurd to suggest . . .. Bookmark the permalink. Apropos of your subject matter above, there’s a new essay over on BibleInterp called “Historical Jesus Studies Today: An Update.” It could be worse. Oddly, though, Powell appears to have mixed up Price and Brodie. But I suppose if you’ve seen one mythicist . . . Recently, however, the “Jesus myth theory” (as it is called) has been taken up in earnest by a handful of academic scholars, including Robert M. Price, a respected New Testament professor who remains a Christian, committed to faith in the mythical Jesus, while maintaining that the historical Jesus did not exist. I don’t think Price would call himself a Christian, although he has expressed a certain amount of comfort in the old hymns and rituals. Anyhow, I’m sure that famous old peer review will kick in soon and all will be well again. Most Historians do not regard their field as a “SCIENCE.” Generally it is considered one of the humanities. Since it involves studying human beings. And in a way that itself often involves subjective opinions. The author himself by the way, is not really an historian; he works for institutions that are primarily religious. While most of the churches associated with such writers, often swear allegiance to “faith”; which means believing in things without evidence. The claim by Jesus historians to be “scientists” therefore is highly suspect. Or indeed, the claim is simply untenable in serious company, among actual historians. Historical Jesus Studies are accepted and published as “science” only in religious institutions that know nothing about real history. Or science either. I noticed, too, a couple of references to “bias” that struck me as a bit off-key. Such analysis is supposed to be free of religious (or anti-religious) bias, and scholars engaged in the field call each other to task when they suspect that one’s conclusions have been influenced by personal predilection. It’s naive to think one can escape ones biases or put them aside completely. The honest historian admits his biases and strives to maintain fairness and balance. That is, rather than pretend that I am presenting an unbiased case, I will tell you up front about my biases and strive to represent conflicting points of view fully, accurately, and fairly. I would contrast this approach with the dishonest theologians who fancy themselves as historians and who feign objectivity while advancing their own dogmatic, predetermined conclusions. He doesn’t any more, but he did until not long ago. I happened to be listening the other day to one of his podcasts from 2012, and he mentioned having only recently decided that he could no longer justify claiming to be a Christian.